ATV tourism is quickly turning into an economic boon for the North Country. Discover why this motorized sport is both a blast and a factor in revitalizing northern communities. Imagine. On a cool summer morning, you pack your gear — sturdy shoes, water, navigation — and head north for a day in the mountains. You hit the trails, crisscrossing state borders and property lines, watching for moose and waving at fellow adventurers you pass along the way. At the top of a trying ascent, you round a corner and the Great North Woods bursts open, revealing a 180-degree vista of wildflowers and hills giving way to distant peaks. You pause, take a breath, perhaps snap a photo, before beginning your descent. Back at the trailhead, you pile into the car, dirt streaked across your forehead and your ankles, and, with a new set of mountain memories made, turn toward home. It’s a scene familiar to most New Hampshirites, but think back: What was your vehicle on the trails the last time you had a day like that? A mountain bike? Your own two hiking feet? Based on last year’s OHRV (off-highway recreational vehicles) registration numbers, an estimated 35,000 people will explore New Hampshire this summer in all-terrain vehicles, and if you’re not among them, that fact is more likely to make you scoff than smile. But there’s more to this branch of recreation than you’re likely to realize as you pass it on a trail or encounter it at a campground. ATVs are fun, they’re inclusive, and they’re saving the North Country — whether you like it or not. Information on the over 1,000 miles of interconnected ATV trails in New Hampshire's Coös County. The one-stop-shop for enjoying the network of trails. They offer rentals, tours, information and more. When I pulled up to the Jericho ATV Festival in Berlin last August, I thought I would be incognito. I’d dressed in practical riding clothes — sneakers, Polaris jersey, rain jacket — and arrived without any telltale reporters’ notebooks or cameras. The first person I stopped to interview, an ATV dealership owner, saw through it — fast. I sputtered a “not exactly” but conceded his point — I was a type. Of course, he was right. I’d never been in a soft-sided Jeep before last summer, let alone an ATV, and what’s worse, I’d refrained despite growing up around them. I was in 4-H for 10 years as a kid. My cousins were ATV apostles, riding them around rural Indiana and collecting them alongside the BMX bikes they raced on the weekends. It’s not that I couldn’t have tried ATVing; I chose not to. And I’m not alone. Flipping through a book of property listings at the Camp RZR festival in September, I struck up a conversation with a real estate agent. There were lots of listings in ski towns in his book, I noted, and lots in Berlin-Gorham and points farther north. Who’s buying these? He gave a knowing sigh. They’re similar in income — a vacation home requires a hefty wallet no matter its zip code — but different in, well, most everything else. The couple looking for a ski chalet in Conway is not the couple looking for a cabin near the riding trails in Colebrook. He didn’t have to explain for me to know what he meant. You’ll notice that neither the real estate agent nor the dealer offered their names, and that’s not a coincidence. Everyone in the ATV world knows that their sport of choice has a reputation problem — but no one wants to be caught talking about it. Corrine Rober of Bear Rock Adventures. Corrine Rober is the exception to that rule. The friendly North Country transplant is tall, thin and blonde — willowy, you might say, if not for her obvious toughness — fond of organic foods and talk of her optimism about the future of her adopted home region. Asked to guess what businesses she’s owned in the area, you might come up with her first, a farm-to-table Southwestern restaurant in Glen. You’d be less likely to land on her second: the Pittsburg-based ATV rental company Bear Rock Adventures. Rober compares the development of New Hampshire’s ATV industry to its closest counterpart, the Hatfield-McCoy Trail System in West Virginia. One of the largest off-road trail systems on Earth, Hatfield-McCoy put West Virginia on the map nearly 20 years ago as the country’s premier place for ATVing. The trails, the crowds they draw, and their economic impact are all huge, but they’re also, according to Rober, narrowly focused. “They spoke to one market,” she says — enthusiasts. Dedicated five years ago this month, New Hampshire’s trail system — the 1,000-mile, nonprofit-maintained Ride the Wilds — initially followed West Virginia’s lead. Like West Virginia, our terrain (particularly in the state’s northernmost reaches) is suited for riding: rugged without being dangerous, beautiful without being overly pristine. Further, becoming a must-see destination for an entire branch of recreation could transform a region’s economy — and the former mill towns that the trails bisect could certainly use the boost. But what Rober and other early pioneers of New Hampshire’s ATV economy realized is that the trails are, literally and figuratively, two-way streets. If far-flung visitors are flocking to our trails, it must be because they are truly world-class. To visit the Great North Woods, or even to live there, without trying them? “It’d be like going to Paris and not going to the Eiffel Tower," says Rober. A successful trail system wouldn’t just draw in people who already love ATVs; it would attract those who’ve never been in an ATV but who happen to live within a stone’s throw of the region’s best place to try one out. And those first-timers can come from a broader swath of the population than you might guess. In quick succession over dinner at Pittsburg’s Rainbow Grille, Rober lists five groups of people she sees as perfect for ATVs. Hikers can use them to take the scenic route to their favorite trail. Fishermen can ride to ponds and streams they couldn’t reach on foot. The elderly and the disabled can strap in to see parts of the great outdoors that all-comers’ nature trails miss. Even the perennially experience-seeking millennial is a natural fit for ATVing — particularly when companies like Bear Rock can give you a taste of the sport without the commitment of buying your own gear. ATVs can appeal to just about everyone, Rober says, but to reach people, you have to get past the notion of off-roading as nasty, brutish, dangerous and loud. How to do that? First, treat it like a business: top-of-the-line equipment, safety training, and respect for the homeowners who’ve allowed mini-highways to be built alongside their once-isolated homes. And second? Get people on the trails. My first time on an ATV, I expected disaster, and said so to anyone who’d listen. I’m a bad, anxious driver on the tamest of roads, and I’ve never been outdoorsy either. I was certain I would emerge from my ATV attempt scarred, emotionally at best, physically at worst. By mile five, I was converted. Bouncing along in the passenger seat of a Polaris RZR S4 900 — a four-seater that retails for just shy of $20,000 — I realized that this was fun. Thirty miles an hour felt like 70 as we whizzed through the woods, wind blowing the few wisps of our hair that poked out from our helmets, and the views were incredible. We came to a decommissioned logging bridge that my subpar hiking skills could never have brought me to, and as Indian Stream roared beneath us, I started to believe Rober’s insistence that this sport really was a great nature equalizer. An hour or so in, I agreed to trade seats with the Polaris rep I’d begged to have as my driver. He posited that it’d be good for my research to get some piloting experience and assured me that the next stretch of trail was easy. What he didn’t tell me was that the stretch after that would take us directly up a mountain — and that he had no plans on switching back before we got there. I laughed out loud when we got to the base, mostly to mask my terror. You expect me to drive what up what? But with a shift of gears, a steady pace, and some careful maneuvering, I got us to the top. Looking back down the mountain from the summit, I had the same feeling I do at the apex of a big hike: I did that. It wasn’t easy. It took skill. But that was me. At the end of my trip, I posted a picture of my muddied ATV on Instagram with the caption, “I drove this up a mountain today.” My friends were shocked — they couldn’t believe that indoorsy, uncoordinated Sarah had pulled something that difficult off. Well, I had, I told them. And it was the most fun I’d had all summer. The ATV industry does have problems that extend beyond reputation, enough that the dealer from the Jericho festival told me twice in our 10-minute conversation that the industry — one he’s been in for a decades as a consumer and a professional — is dying. But, up close, the issues aren’t as bad as an initial glance makes them seem. The first fear on any ATV newbie’s mind is that ATVS are dangerous — and, make no mistake, they can be. Like in any industry with risk involved, though, ATVs come loaded with a host of regulations and laws to maximize safety. In New Hampshire, helmets and goggles are required for any rider under 18 and strongly encouraged for adults. Rental companies and dealerships alike will pepper riders with safety tips — keep your speed reasonable, use switchbacks on steep inclines — that, when followed, drastically reduce your chance of injury. The New Hampshire Fish and Game Department logged just 46 accidents last year among all off-highway recreational vehicles (a category including both ATVs and snowmobiles), and the majority were caused by factors entirely within the driver’s control. Speed, inattention, recklessness and alcohol appeared in accident reports a combined 45 times last year, mirroring what Bear Rock employees told me before my first ride: Drive irresponsibly, and you’ll probably get hurt. Drive carefully, and you should be fine. Even the grim tales of ATV fatalities you hear on the news tend not to reflect the reality. According to the US Consumer Product Safety Commission, New Hampshire reported only 73 ATV-related deaths from 1982 to 2016. Compare that to automobile-accident fatalities: per the Insurance Institute for Highway Safety, New Hampshire reported 136 in 2016 alone. Racing in the mud pit is a popular activity at both Camp RZR and the Jericho ATV Festival. A trickier issue is an ATV’s impact on the environment. It’s hard to argue that riding what’s basically a car through the woods is a green activity — but who’s to say an afternoon of ATVing is worse than tromping on wildflowers on a trail run or leaving trash behind after a camping trip? On a micro level, riders in New Hampshire can be roundly punished for veering off designated trails — including with fines up to $10,000 for encroaching on wetlands — and at the macro end, nearly all the major ATV manufacturers have detailed environmental policies and strategic plans for lessening the impact of their products and themselves as corporations. Minnesota-based Polaris has even rolled out a fleet of electric vehicles, including one from their trail-ready Ranger utility vehicle line. ATVs lack the tree-hugger cred of New Hampshire’s other outdoor recreation, but Steve Livingston, owner of Livingston’s Arctic Cat in Hillsborough, may have put it best when I ducked into his tent during a rainstorm at the Jericho festival. When the state took control in 2005 of the land that would become Jericho Mountain State Park, the road from downtown Berlin into the park was lined by almost nothing. 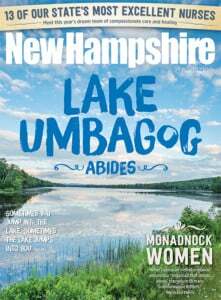 Chris Gamache, the chief of the Trails Bureau of the New Hampshire Division of Parks and Recreation, recalls a steel factory, a beer distributor and a handful of houses, but not much else. Today, that same stretch of NH-110 boasts three restaurants, three ATV and snowmobile dealerships, and two campgrounds — and on one Friday morning last September, standstill traffic snaked past all of them as thousands of people made their way to Jericho for Camp RZR, one of the largest ATV festivals in the United States. The nearest available hotel room was an hour away in Conway. The Grammy-winning country trio The Band Perry was coming to town for a Saturday-night festival performance, and over the course of three days, 12,000 visitors would pour into the 10,000-person town of Berlin. Say what you want about ATVs, but ask yourself: Even when the pre-Les Otten Balsams was in its heyday and every mill in the state was still booming, what else could draw that many people that far north? Gamache admits that, during an event like Camp RZR or the Jericho ATV Festival, his office gets complaints from locals, wishing they could lower the noise or quell the chaos from a five-digit visitor count. But present those complaints to the selectmen or a business owner, and you’ll hear the same few refrains: Not possible. You’re crazy. This pays the taxes. Every ATVer that comes to Coös County will need lodging, meals and services that range from gas stations to doctors’ offices to places to buy extra riding goggles or off-rider bumper stickers. Those service-industry businesses will employ dozens of locals, from lifeguards to bartenders, and those lifeguards and bartenders will need schoolteachers and bank tellers and cops. The stream of ATVers that will flock into the North Country this summer will keep entire towns afloat, and what’s more, the industry will pay for its own maintenance — something that can’t be said of birdwatching or snowshoeing. To ride an off-highway recreational vehicle in New Hampshire outside of your own property, you have to register it. Registration fees run from $50 to $100 depending on vehicle type and residency status (non-Granite Staters pay steeper fees), and that money goes directly to the Trails Bureau, which, in turn, keeps the state’s 1,000-plus miles of trails clean and rider-ready. The northern half of the state is a calm place, and a beautiful one, even if your mode of choice for exploring it is a noisy, muddy four-wheeler. Last year’s Jericho festival offered helicopter rides for a small fee, and I took one, expecting to be disturbed by the sight of pillbox vehicles cutting through the trees. From the air, though, it all looked peaceful — kids running around a clearing, people shopping for new gear, ATVs snaking through the woods out one window and a family of deer pausing by a stream out the other. Like the state itself, ATVing in New Hampshire can be rough, adventurous and wild. But it can also bring you face-to-face with a moose, or transport you to a spot, deep in the woods or on the edge of a mountain, that will fill you with gratitude for a world with views that look like these. If you’ve never been on an ATV, you probably think they’re not for you. But hop on one this summer. I think you’ll find they are.